Another suitably priced multi functional devices from Brother, Brother DCP 1610W is quite a compact printer. It also boasts WiFi connectivity which helps in case multiple devices are to be connected to it. It has a high print resolution of 2400 x 1200 dpi and a scanner that could scan upto 1200x600 dpi. Brother DCP 1610W also has a quick first page print time of under 12 seconds, which along with a print speed of 20 ppm makes it a good workhorse. While its drum lasts for more than 10000 pages, the toner is good for 1000 pages, which makes it costly to run. However, this can be easily resolved by using compatible Brother DCP 1610W toner cartridges. It has a 150 sheet paper tray which is good enough for most printing needs. One interesting and useful feature of Brother DCP 1610W is the control panel, which gives you a lot of autonomy in output with many functions available at the press of a button, from choosing fuel type to the device to which the output goes, the panel serves many functions. Other than the control panel, other attractions of Brother DCP 1610W are the excellent quality of prints. Many MFDs don't have good photocopying capability, but that too is of good quality here. Brother DCP 1610W is a really compact printer with very good quality print, scan and photocopy outputs. It also is easy to connect with WiFi in medium size offices. The control panel adds to its ease of use. Given toner’s print life of 1000 pages, makes it a little expensive for long run. However, this issue can be sort out by using compatible Brother DCP 1610W toner cartridges which gives similar quality outputs at much lower costs. How to clean the drum unit? The Brother DCP 1610W Printer is a mono laser printer. It offers multiple functionality. It is a good value for money. But the parts of the printer like any other machine require cleaning and maintenance at times. If the internal parts like the drum unit are not cleaned then the print quality problems like toner marks along the printouts can occur. In cases of unclean drum unit, you will notice the toner marks repeating at a certain interval throughout the page. To avoid such problems, you need to clean the internal parts and replace any if required. Open the front cover of your Brother DCP 1610W printer. Locate the toner cartridge and drum unit assembly. Take it out from the printer. There will be green lock lever present on the drum unit. This lever hold the Brother DCP 1610W Toner Cartridge in place. Press it to unlock the toner cartridge. Keep the Brother DCP 1610W Toner Cartridge carefully as it will have to be installed back into the printer. Turn the drum unit. The gear of the drum unit has to be on the left side. Place it on a piece of paper. Now gently turn the edge of this drum unit towards yourself. Do so while inspecting the suspected area’s surface. If you notice anything then remove it. Take a dry cotton swab and wipe the surface until the toner marks on the surface get cleaned. Now turn it again. Take the Brother DCP 1610W Toner Cartridge that you had kept aside and place it in the drum unit. Push it till it clicks in place. This means that the toner cartridge is now locked into the drum unit. Return back this assembly into the printer and close the front cover. Take a test print to check if the toner marks are still there or the problem has been solved. Q. My PC has a Windows Vista OS. But as there are different versions of Windows Vista like the Home Basic, Home Premium etc., do I need to install a Brother DCP 1610 printer driver depending on the version I am using? Please help. Q. Why does the screen continue to display the message ‘replace toner’ even after installing a new Brother DCP 1610W toner cartridge? A. Please follow the steps given below to if the screen keeps showing messages like ‘toner low’, replace toner or ‘toner ended’ even after a new Brother DCP 1610W toner cartridge is installed. If the problem persists, please contact Brother Customer Care to resolve the issue. Q. Can you please list the high quality Brother DCP 1610W toner cartridges for my printer? A. The compatible BROTHER TN1050 toner cartridge (black) available on this page are high quality toner cartridge compatible to your printer. Along with great prints, this low cost print cartridge also offers a great saving on your overall printing budget. This Brother DCP 1610W toner cartridge can print upto 1000 pages at 5% coverage rate. Q. Can you tell me what are the best practices to keep my Brother DCP 1610W printer clean? Before you proceed make sure to read the guidelines in the Product Safety Guide before cleaning the machine. Clean the outside and inside of the machine regularly with a dry, lint-free cloth. When you replace the toner cartridge or the drum unit, make sure that you clean the inside of the machine. If printed pages are stained with toner, clean the inside of the machine with a dry, lint-free cloth. WARNING: DO NOT use flammable substances, any type of spray, or an organic solvent/liquid containing alcohol or ammonia to clean the inside or outside of the product. Doing so could cause a fire or electrical shock. Instead, use only a dry, lint-free cloth. Q. Can you list the essential consumables for my Brother DCP 1610W printer? A. This Brother machine requires Brother DCP 1610W toner cartridge also known as BROTHER TN1050 Laser Toner and a drum unit DR1050 to start printing. Q. Can I print colour images from my Brother DCP 1610W printer if I replace this TN1050 black Brother DCP 1610W toner cartridge with other compatible colour cartridge? A. The Brother DCP 1610W printer model is a monochrome laser printer which can only print in black. There are no colour toner (neither original nor compatible) available for this machine. Please find all the compatible Brother DCP 1610W toner cartridges and drum unit that work fine with Brother DCP 1610W printer are listed above on this page. Q. 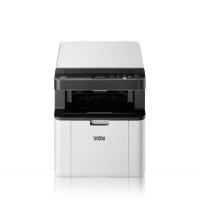 How much would it cost if I buy 2 TN1050 for my Brother DCP 1610W printer? A. The Brother TN1050 toner cartridge costs €19.99 (Inc. VAT). Buying 2 Brother DCP 1610W toner cartridge would cost you €39.98. However, you can go for the multipack of these Brother TN1050 toners on our site which is available at much lower rate and would cost you €36.99 (Inc VAT) only. Q. How to transfer faxes and Fax Journal reports from Brother DCP 1610W printer to another fax machines? Press Menu, 9, 0, 1. If the LCD shows No Data, there are no faxes left in the machine’s memory. Press Stop/Exit. Enter the fax number to which faxes will be forwarded. Note: If you have not set up your Station ID, you cannot enter fax transfer mode. Press Menu, 0, 2 to register your fax number, telephone number and name. Press Menu, 9, 0, 2. Enter the fax number to which the Fax Journal report will be forwarded. If these steps do not work call Brother support for detailed technical help.